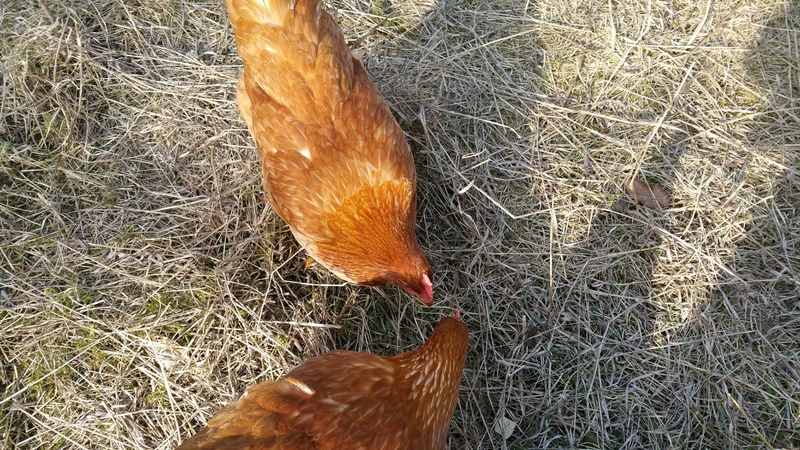 1. the girls are still young (about 20 weeks old) and have only been laying for about 10 days. 2. it has still been quite cold. At – 8 degrees C this morning, we broke another record low temperature for the date. Snow is forecast for later this evening, the fifth time in a stretch 8 days (yes, we are counting!) Thankfully, it looks like more normal spring weather will arrive later this week. Good weather should encourage egg laying. 3. the girls’ diet is not 100% layer pellets which are especially formulated to produce lots of eggs. Yes, we feed them quite a bit of that but we let them get just a little bit hungry between feedings so that they go out and forage for grass, weeds, seeds, bugs, worms and kitchen scraps (and also work the composting leaf pile for us. See Doing their job). Not only is that mixed diet healthier for them in the long run and less costly for us, but their eggs are apparently more nutritious as well. But, we understand that the downside is that they may not lay quite as many eggs as if they were on an all-you-can-eat diet of layer pellets. Yes, there are little blades of green grass amidst the brown on the ground and these girls are quite happily eating the tender little shoots. The girls have come to associate us with food and come running whenever we appear. 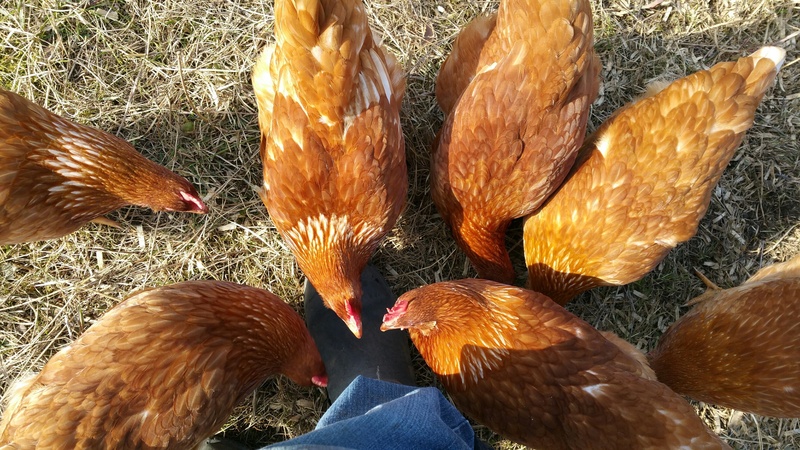 Here they have developed a fascination with my boot and most of them are taking little pecks at it. Despite their nutritious alternate diet, they do love their pellets and in this video are busy pecking away and sounding like they are enjoying the food. Note part way through the one chicken perching on the edge of the water bucket (yellow). We had thought that the water bucket was perfect for them and for keeping the water clean – low enough for them to reach the water but too high for them to get their water dirty. Looks like this girl has found a way to get dirt in the water. Oh well…. They are very diligent workers!